Stella never expected to land in a small town like Thunder Basin, where she's just been ripped from her former life after witnessing a brutal murder arriving home late one night. Her wealthy single mother feeds her drug addiction through her dealer, who Stella is now being protected from. With her new life in witness protection comes her new identity, a gruff retired police officer as her new foster mother, Stella has traded her uptown lifestyle for the dust bowl of a rural town where it proves difficult to keep a secret while praying Danny Balando's cartel can't find her. Carmina or Gran as she's known in Thunder Basin, vows to keep Stella safe which seemingly includes keeping her distance from the boy next door Chet, handsome, strong and a boy who represents all that Thunder Basin is. Keeping her identity a secret, it isn't long before Chet and Stella form a tentative friendship, with her boyfriend in Reed never too far from her thoughts. Through Chet, the small town takes Stella into their fold and finally gives the almost eighteen year old a sense of home and familiarity. All apart from the wealthy and golden boy in town Trigger McClure. Trigger likes his girls demure and has a history of violence that the town turn a blind eye to and now he has his sights set on Stella, determined to find out who she really is. Becca Fitzpatrick's second foray into the world of young adult thrillers was brilliant. It blends a wonderful contemporary romance with a heart pounding thriller that will no doubt earn the Hush Hush author a more mature audience. I loved it and it's by far her best release to date. Mixing a contemporary with a traditional thriller, the blend produces an engaging and enthralling read that will no doubt also lure readers in with it's slow burning romance and intense storyline that sways between young and new adult. Stella's character has been placed into obscurity for her own safety against a man she's accused of murder. Her mother's drug dealer with underworld crime connections is seeking revenge against the girl who's story has put him behind bars. She's angry, not only at her deadbeat mother placing her in that position but being forced to leave behind her comfortable life and boyfriend Reed. So when she's placed into witness protection with a gruff former police officer in a dust bowl of a tiny town, she's counting down the days until she turns eighteen and can escape. But then she meets boy next door, the utterly charming Chet. Chet is not only raising his younger brother alone, but is still coping with the loss of his parents. He instantly forms an attraction to Stella's sassy attitude and the two form an easy but gentle friendship. I found the romance incredibly lovely and most surprisingly, relatively drama free. Being in witness protection, Stella can't reveal her true identity and although she's attracted to Chet, refuses to act on her feelings which is a refreshing change. She soon settles into life in Thunder Basin but being an outsider and not conforming to small town values, it isn't long before she catches the eye the town darling in Trigger. But Trigger isn't a love interest, far from it and his history of violence against the town's young female population may be notorious, but even authorities turn a blind eye. His vendetta against Stella becomes a dangerous situation not only due to his violent history but he knows that Stella isn't who she seems to be. It does touch on violence against women and may be a trigger for those who have been in a violent or abusive situation or relationship, so please be mindful that most readers will find Trigger's character confronting. Stella undergoes an incredible transformation from wanting to escape Thunder Basin, to warming to the community and even her guardian in Carmina. Seeing their relationship bloom and the former police officer becoming the mother figure that Stella never had. Stella begins to realise she's fallen in love with her new life, but never becomes complacent. She's aware that her life is in danger, but ever allows that fear to overcome her or stop her from living. Becca Fitzpatrick has finally found her niche, carving her very own genre with a blend of a contemporary thriller, with a slow burning romance and small town charm. From cover to cover, it delighted, enthralled and enchanted me. I loved it immensely. As part of my tour stop for Becca Fitzpatrick's Dangerous Lies releasing tomorrow, I've decided to take photos from around my local area. Dangerous Lies is set in the small country town of Thunder Basin which could almost be just a stroll from my own doorstep. But living in rural Australia as apposed to Nebraska, both share a dry, arid heat where not only do the tough survive, but thrive. Kelly is on a semi hiatus, as she's got stuff going on. Remember to enter our International Lillytales bookmark giveaway here. I'm glad this one was a hit, Kelly! I've got it on my night table this week, so I'm excited to read it. I really enjoyed it Joy, by far her best release to date. Really looking forward to seeing what you think of it. Thanks for sharing. I'm glad this one really worked for you. I might have to check it out. I love a well-done thriller. Me too Lauren and this is definitely her best release to date. I enjoyed it more for it's contemporary storyline and romance though, which was really lovely. Would love to see what you think of it, I think you'd really enjoy this one too! I really like the sound of this! :-) another one for my TBR. I think you'd really love this one too Sarah, it's such a fantastic read. I'll be hosting a giveaway next month for a special edition copy of Dangerous Lies, so keep an eye out if you don't pick up a copy in the meantime. Can't wait to see what you think of it. 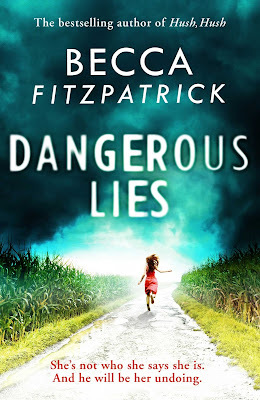 Sounds like Becca Fitzpatrick improves with every book, there's not many people writing YA Thrillers, so I am glad to hear that Fitzpatrick found her niche there. It sounds fantastic, I will have to check it out at some point, although I think this sounds like a book I'll have to work myself up for bc Trigger sounds creepy af!! You're right Aentee, there aren't many around is there. I really loved the mixture of romance and contemporary thriller, it was definitely her best release to date. Trigger was such a horrid character, just wait until you meet him. It's not all doom and gloom, the romance is really lovely and so incredibly swoony too. I started this one last night. I have to admit I'm not a huge fan of the heroine so far. She's driving me insane with her spoiled attitude but since you mentioned her growth I'm going to keep on reading. I already like the sound of Chet a lot. I think he's going to be my favorite. I want to know what the deal is with Reed though. Something about him is fishy! Glad you enjoyed this one, Kelly! She's really abrasive on the beginning Nick, but don't let that cloud your judgement. She does undergo massive character growth. And Chet! Insert swooning here. I loved his character, a real southern gentleman. Can't wait to see what you think of it Nick. I am currently reading this, so far enjoying it, but then I been in the mood for thrillers so o.o. This is my first book by her and I am very excited to see how it pans out for me! Ooh, I can't wait to see what you think of it Lily. I loved it and can't wait to see what she's working on next! I need to read this or Black Ice. I read some of the Hush, Hush series and wasn't happy with it, so I've avoided. This sounds really interesting though. And the photos are gorgeous - could definitely be where I live in California too. I really enjoyed Black Ice too Christy, but Dangerous Lies is a much better read as the Black Ice protagonist is incredibly frustrating and consistently makes stupid choices for herself. And thank you. It was fun exploring my own urban rural area to take them, I could imagine it as being the Aussie version of Thunder Basin. I've only heard of Hush, Hush, which I know was problematic, so I'm interested in this one since I've seen other people praising it as well. And I love that graphic! I wasn't a fan of Hush Hush Shannelle. I don't know if it was because it felt so young and I'm a mature reader or that the characters all grated on my nerves. But Dangerous Lies is an incredible read! The romance is swoony and the city girl being stuck in a small town has such a charm to the storyline, I loved it. I didn’t know Australian cover is different. It’s gorgeous, I like it better. I haven’t read anything by this author yet, looks like this book is a great one to start. Thanks for warning about Trigger, I prefer to know about such things before I start a book. Wonderful review, Kelly! The Aussie cover really is gorgeous isn't it. This is the perfect Becca Fitzpatrick book to start with Ksenia, it really does have it all. Intrigue, suspense, romance. It's the perfect blend. I loved it and would love to see what you think of it too. I'm hearing very good things about this book!!!! It's such an awesome read Deb, a great mix of suspense and romance. I wasn't too fond of the Hush Hush books, probably because of the fantasy aspect, but I'm really curious about this one. It sounds really mature. Wonderful review as always! Thanks Blessie. I wasn't a fan of Hush Hush either, but have really been enjoying her stand alone thrillers. They're so much more mature than her young adult series and this is the best one yet. I'm side-eyeing this book because of how much I hated Hush Hush. But it sounds like the balance with the romance was done well, it sounds quite creepy as well with the violent tendencies at all. I don't think this is a book for me, because of the whole stockholm syndrome and stuff, but glad to hear you enjoyed it! Thanks for the review Kelly. I think you might be thinking of Black Ice Jeann, as this one doesn't feature the whole Stockholm scenario. It's basically a girl placed into protective custody while waiting out the mafia and having to start her life over as someone else. It was so well written and the romance was really lovely too. Do give it a go, I think it'll really surprise you.